I bet you have already heard about açaí, the Brazilian super fruit from Northern Brazil… Well, great! 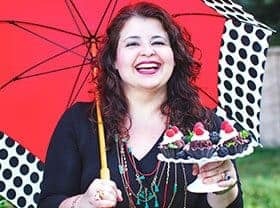 Because a super creamy and tasty Açaí Milkshake is what I am sharing with you today as well as some interesting facts about this fruit. If you live in United States, you’re probably tired of hearing so many ads about this berry, which has been appearing in everything from food products, health supplements, and diet products to cosmetics and beauty products. I know: it is overwhelming! But what is açaí? And what is it importance? Come with me on this journey. 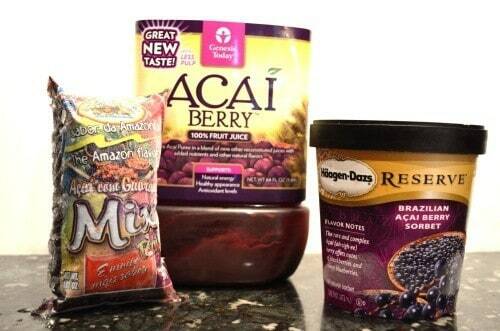 Açaí is a purple berry which is only found in the Amazon rain forest. It grows on large palm trees, oddly in bunches similar to bananas. In terms of flavor, it has its own unique taste, quite unlike anything else you’ve ever eaten. It is not as sweet as most berries, and just a little tart, with traces of chocolate and cloves. Healthwise, it is full of omega fats, amino acids, electrolytes, antioxidants, protein and vitamins A, B1 and E.
The açaí berry is used in many food dishes– everything from drinks to breakfast items. It is even used to flavor meat and fish dishes. In the Brazilian Amazon, açaí-based drinks are more popular than milk. The Amazon tribes have long used the açaí berry as a treatment for digestive problems, skin irritation, sexual dysfunction and even insomnia. Its naturally low sugar content, makes it safe for diabetics as well. Due to its rich fat content, the berries must be harvested and processed in order to prevent rapid spoilage, so generally the fresh berry is not available for exportation. In United States, this berry can be found incorporated in juices, fruit cups, ice cream, and frozen fruit pulp, as you can see in the image below. Today you may even be able to find the açaí berry as an ingredient at your local smoothie store, as I did. In Brazil, one of its most popular use is açaí bowl or açaí na tigela, served in gyms. At my house, I use it to make both açaí milkshake and smoothie. 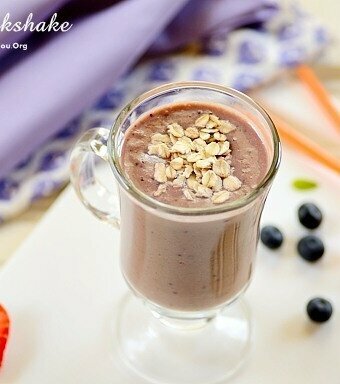 So açaí milkshake is the recipe that I have for you today. 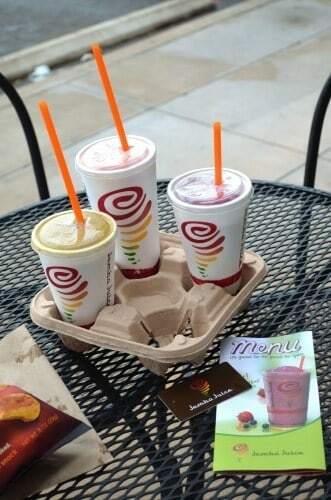 Açaí milkshake is both a drink and dessert that has as its base açaí ice cream, milk, and a blend of fruits. 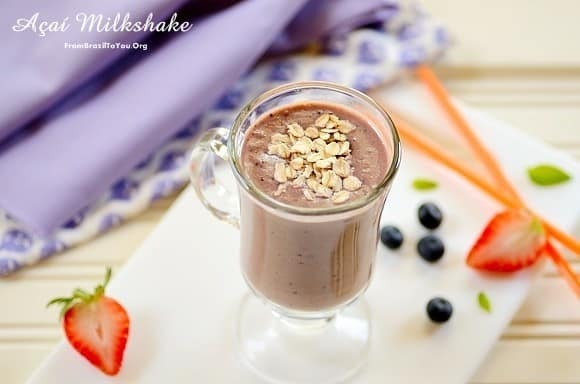 To make the açaí milkshake, blend well the ice cream, milk, fruits, sugar, and wheat germ (optional) in the blender. 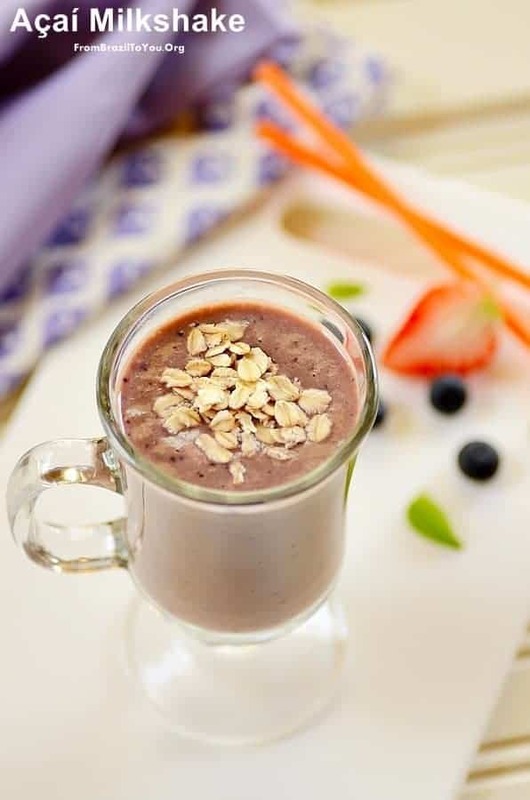 Pour açaí milkshake into medium glasses and enjoy! You can use FROZEN berries instead of fresh strawberries, blueberries, and raspberries. Very nice post. I just stumbled upon your weblog and wished to say that I have truly enjoyed surfing around your weblog posts. How delightful to find a blog that covers Brazilian cuisine. We learned about Açai when we visited Belém about a year and a half ago, and saw huge baskets of the berries on the dock when we were returning to our cruise ship. When we were visiting the Mercado Ver-o-Paso market, we saw several açai stands and were told about having açai bowls for breakfast (and I think that we probably wouldn’t like them). It made me curious, and my husband and I have since become addicted to them. I now keep a good supply of the frozen pulp in my freezer so I can do that. Hi, Susan! It was delightful to hear about your adventure in Northern Brazil. I am glad that both you and your husband enjoy açaí! 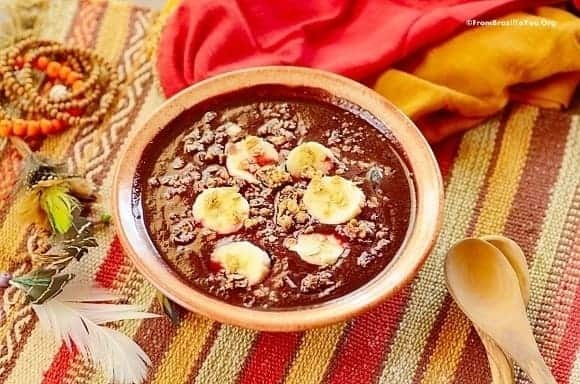 Although açaí na tigela (served in a bowl) is popular in Brazil, I confess that I do prefer to have it in ice cream, milkshake, smoothie, or juice. It contains a lot of antioxidants. I hope you visit us again and find Brazilian dishes that your family would enjoy. Have a great weekend!